DESC were rampant in the section introduced for the first time this season, even making NSL kings Lycee Francais International Georges Pompidou look ordinary as the French school were brushed aside in Saturday’s final 3-1. DESC had been one of the standout teams during the group stages and met little opposition as they made their way to the final at The Sevens, completing a dream NSL debut by lifting the trophy. Terry has been so impressed with the organisation of the tournament that he hopes the school send older age grade teams to fight for glory on three fronts next season. “I hope so,” replied Barratt when asked if the team would defend their title next season. “The boys have had a great time. It’s well organised and the kids love the media coverage. I’m sure we’ll be back to defend our title and hopefully we’ll bring a few of the other age groups too and look for those titles, because at DESC we’re really passionate about football and sport in general. DESC stormed into an early 2-0 lead in the final, pocket rocket Luis Dunn opening the scoring after beating LFI goalkeeper Cyprien Girod at his near post with a low drive before James Aubrey doubled their advantage seconds later. LFI reduced the deficit early in the second half when Badis Zerguerras prodded in after stopper Nathan Westie only partially dealt with a corner, but DESC snuffed out any hope of a comeback when Leo Mulrainy blasted home after Dunn had been thwarted by Girod following a mazy run. And Barratt singled out his star playmaker Dunn for special praise. “He’s a fantastic player,” said Barratt. Even in the DASSA (Dubai Affiliated School Sport Association) Leagues we play in he comes up against some big rugby boys but he shields the ball really well and he’s a fantastic little player. “He’s got fantastic feet and can finish. Just like Messi he shows you don’t have to be big to play. He certainly showed it today. “We started really well and it went 2-0 but then they got back to 2-1 and it made it a good game. It was feisty and there was a good tempo. Being so young and playing in a new competition, in front of a big crowd, might well have been intimidating, but Barratt had no such concerns. He added: “One thing we talk about is having the confidence. They knew they were being tested and knew they were in for a game, but all the time they know they have the ability. With LFI Pompidou looking to retain their Under 14’s Emirates Islamic National School League Football title the soccer action at the Sevens Stadium Dubai was non stop. 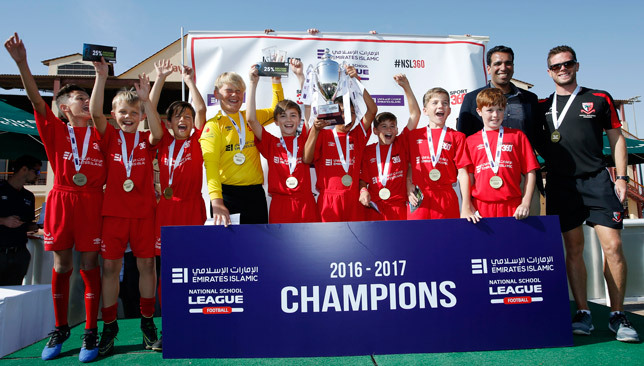 Lycee Francais International Georges Pompidou confirmed their status as Emirates Islamic National School League Football royalty as they retained both their Under-14s and U-16s titles. Frederic Deswarte’s team brushed aside tournament debutants Al Ain Juniors 6-2 in the U-16s showpiece at The Sevens on Saturday, while their younger counterparts similarly met little resistence as they swept to a 4-1 win in the U-14s final against Wellington International School. For two of the goalscorers in the U-16s final, victory was particularly memorable. Chanin Hamdaoui and Tom Kassis cemented their reputations as boys for the grandest stage as both netted having played pivotal roles a year ago. Just as LFI repeated as champions, Hamdaoui reprised his role as star act as he took away the player-of-the-match accolade for the second year in a row. “To be player of the match in the final for the second year in a row, it’s good, I am happy. I’m so happy I have no words. “I think this second win feels more special. It’s always harder to win it the second time. Team-mate Kassis, also 15, also got on the scoresheet, a year after he was the catalysts for the U-14s epic victory against Al Salef Sal Saleh Private School. In a thrilling 2015/16 U-14s final, Kassis bagged a hat-trick, the third of which was a golden-goal clincher in extra time handed LFI victory. If the purists were hoping for an even contest, it failed to materialise as the defending champions went ahead inside the first minute through captain Thomas Rousse’s opener. There was a moment of controversy when Al Ain’s Mohamed Sajid saw his effort ruled out for a foul on LFI goalkeeper Angelo Vitale. LFI took advantage as Hamdaoui doubled the lead when he caught stopper Abdul Aziz out at his near post. The other last-four clash had been a titanic event, in which Al Ain came from a goal down to triumph 2-1 over GEMS Our Own Indian School in extra time.